San Francisco (YW) Presiding Judge Katherine Feinstein of San Francisco Superior Courts announced her retirement, effective January 31, 2012 after 12 years of serving on the San Francisco Bench and many years as a dedicated public servant. She served as presiding judge during the most tumultuous two years of the courts history while a 98 million dollar budget was whittled down to just 74 million dollars, causing the loss of 10 commissioners, 57 employees and forcing 11 civil courtrooms to close. We’re not necessarily going to cover this story the same way that the Chronicle and others are going to cover it because we want to draft Katherine Feinstein to be appointed the next Attorney General of the State of California when Obama elevates the current AG Harris into his administration, which is seeming increasingly likely. Such a move would certainly permit us to erase the AG’s office off our current Judicial Council org chart and place someone in office who is a strong prosecutor intimate with the issues, a strong supporter and advocate for our trial courts and a fierce opponent of waste and abuse at the highest levels of the judiciary. According to the Chronicle, Judge Feinstein has no plans as of yet for her future and says that the current nosedive in the judicial branch budget has played a significant part in her decision to retire. She currently has no plans for the future. JCW wishes Judge Feinstein well and thanks her for her service to the people of the State of California and the residents of Baghdad by the Bay. 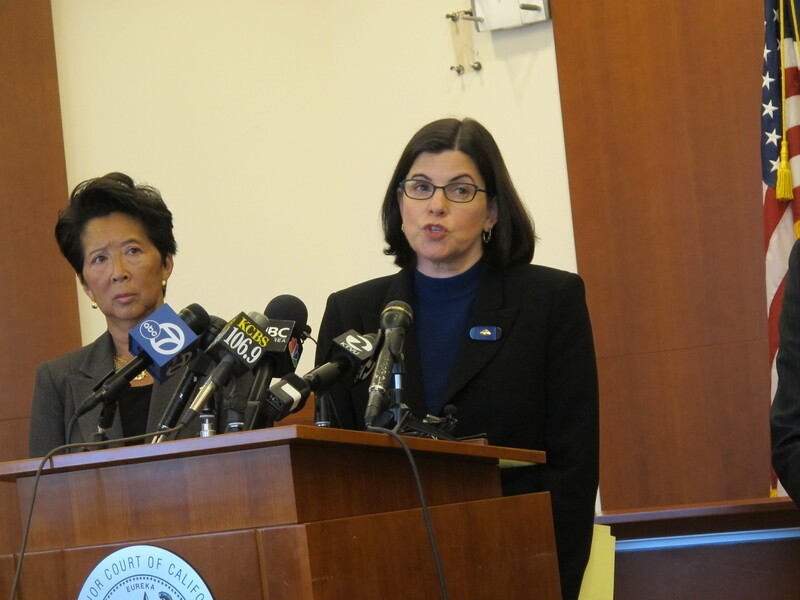 Judge Katherine Feinstein will be replaced by the incoming, recently elected presiding judge Cynthia Ming-Mei Lee. Judge Feinstein is a voice of intelligence and common sense. She had the convictions and courage to stand up to the JC/AOC for the benefit of all trial courts. The branch will miss her leadership and willingness to speak up for reform. I also hope she moves to a leadership position within the state and remains in public service. Having sat in Judge Feinstein’s courtroom, I know her to be a common sense, thoughtful, dedicated, honorable, and ethical judge. Moreover, she brought those same skills and values, and an uncommon grace to her equally important role as a court administrator. Her departure leaves a void in the California trial courts that cannot be replaced. Let us all hope she does indeed now go on to the California Attorney General’s Office. Long live Judge Feinstein. And long live the ACJ. Judge Feinstein thank you for your public service. You will be missed. Who knows? With her mom being a senior member of the senate she may go to the feds. But i like JCWs idea of the AG. Maybe investig the AOC? SAN FRANCISCO (CN) – Judges up and down the state are shaking their heads over a draft from California’s judicial ethics committee, limiting what judges can say in public. The opposition has to do with the tension between the trial judges and a big bureaucracy that sits atop the far-flung California judicial system, and the financial pressure on individual trial courts resulting from enormous budget cuts. Specifically, judges and lawyers are alarmed over a section of the ethics opinion that urges judges to avoid asking lawyers to lobby the Legislature for solutions that would favor one court over another — for example, by taking funds out of one court’s construction project to keep courtrooms operating somewhere else. That section provoked a fiery response from judges in trial courts large and small, from Los Angeles to Vallejo, from Sacramento to Mendocino. “As locally elected officials, judges meet with our locally elected legislators to discuss the impact of budget cuts on our local courts and our shared constituency,” wrote Presiding Judge Laurie Earl of Sacramento on behalf of California’s 58 presiding judges. “It seems inimical to the responsibility of superior court judges to be restricted in our ability to protect our courts and our communities and to prohibit us from asking attorneys to speak to our legislators about matters of local concern,” she wrote. Writing for the Los Angeles County Superior Court, Presiding Judge Lee Edmon said the section curbs free speech. “The Committee provides no analysis as to the propriety of such a vast, content-based restriction. The implicit threat of action by the Commission on Judicial Performance against a judge for ?offensive speech, by which an individual judge expresses his sincere views as to what funding best preserves access to justice, is chilling,” wrote Edmon. Edmon’s comment underscores the long-running tension between the local trial courts and the centralized bureaucracy of the Administrative Office of the Courts which operates under the auspices of the Judicial Council, and has in recent years taken heavy criticism for overreaching its authority, wasting public funds, and interfering with how the courts are run. For many trial judges, the threat of disciplinary action also calls to mind the tenure of former chief justice Ronald George who was said to have used judicial ethics proceedings to control trial judges and keep them in line. Judge Dan Healy in Solano County delivered his criticism from both a personal viewpoint and that of a community devastated by the state’s economic downturn. Writing from rural Mendocino County, Retired Judge James Luther recounted how the county’s presiding judge and six other judges “drove 60 miles through heavy rain and dangerous winds over treacherous mountain roads” to meet with more than 300 colleagues and urge them to work with a group of attorneys to save one of Mendocino’s regional courts. On behalf of the largest judges group in the state, the California Judges Association, Judge Allan Hardcastle of Sonoma County said the committee has no authority under the canons of judicial ethics to tell judges to side with the judiciary over individual courts. Very well said, Hon. Dan Healy. Thank you for your bravery in speaking out. You are now on my Christmas card list, but you have also made the AOC enemies list. My holiday wish is that the Hon. K. Feinstein will help clean up the AOC/JC/CJ mess, whether through the Feds or state — or as a common citizen. Best wishes and regards, Hon. K! Oh, and Matthai, please shut your piehole. Give your Bronx cheers a rest. Thanks Judge Feinstein. She has always been fair, ethical and honest. Her statements about the state of the branch were also direct and forthright and she captured the sad malaise that many courts are living through now. Contrast her statement with the puff piece our Chief and J Jahr issued late today claiming that all is well, that nothing has ever been better, that thanks to them , all is transparent , that significant downsizing and reform has arrived at the JC/AOC and that we are all unified with outreach to all our stakeholder partners. Of course the over 400 plus members of the ACJ were not mentioned. .I read this document in absolute astonishment. The insiders in the tower at 455 Golden Gate honestly are in total denial . Their mantra, we can’t let the truth get in the way of a good story. CCMS, Long Beach, telecommuting OGC lawyers living in Europe, and a more bloated management structure? Never happened.You can’t make this stuff up. Really.